Good morning, friends! A couple of months ago I shared my fitness and nutrition journey with T.R.I.M. boot camp, and today I’ll be sharing more before/after photos and results since completing round 2. FYI: The next round for T.R.I.M. starts October 8th! I love this program so much, that I’m currently on week 3 of my third round. You can sign up here for the next round! If you’re curious about what I eat while on this program, you can check out my post with all of my go-to meals and snacks here. I think it's important that I share a little bit about why I decided to start this boot camp. Long story short, I just wasn't happy with what I was seeing in the mirror. I know we're our own worst critics, but on top of visually not be pleased with my body or the number on the scale, my clothes we're getting pretty snug, I had low energy, my skin would breakout constantly, I wasn't sleeping well, and the list goes on and on. With all of that being said, I have been a frequent gym goer for almost 2 years now (with the occasional week off while traveling). I was really hoping that by going to the gym 3-4 times a week, my 22 year old body would reappear without having to make many changes to my diet.......wrong-O! Unfortunately, I can't just eat whatever I want anymore and it not go straight to all of the wrong places. I knew I needed to find a program that not only worked, but something I could actually stick with. I've tried a handful of diets and various "eating habits" in the past that worked for a couple of weeks (sometimes only a couple of days....dang you, Whole 30), so I knew I needed a sustainable nutrition plan that I could turn into a lifestyle. Enter: T.R.I.M.! I thought the best way to share the key details about this program is to breakdown what it entails, as well as answer some FAQ's I've received on social media over the past several weeks! Fasting.....a word that s c a r e d me going into this program, but is now something I swear by. If you aren't entirely sure what intermittent fasting is, let's break it down. First of all, it is not a diet; it's an eating schedule. In this program, I have a 6-8 hour "feeding window," which means the rest of the time my body is fasting (this primarily happens while I'm sleeping). I typically break my fast around 12:30 P.M. and stop eating around 7:30 or 8:00 P.M. at the latest. What is carb cycling? It's a variation of carbohydrate intake on a weekly basis. On this program we have 2 low-carb days, as well as regular calorie/macro days and low calorie/macro days. Having this variation paired with specific workouts for those days help maximize energy and fat burn levels. On regular and low calorie days, we also track our macros. I was very intimidated with this until I realized the MyFitness Pal app will do all the work for you. This app is a MUST; between keeping track of your calories and counting net carbs, it will also break down your macros for the day. I quickly learned at the beginning of this program that the key to hitting your macro percentages as close as possible is to PLAN AHEAD! The first few weeks of the program, I would input my food for the next day into the app the night before, so I could figure out what worked in my macros/calories and what didn't. Planning is super important so that you aren't way off and scrambling to put another meal together. Q: Are meal plans/recipes included? Yes! Some meal ideas are included in the packet you'll receive when you sign up for the program. There will also be a nutrition guide provided that that will help you determine the most ideal foods to consume on low carb days, regular calorie, and low calorie days. A macro cookbook with over 700 recipes is included as well! Q: Are workouts included? Yes! A in-depth workout plan for each day is provided. Q: Do I have to belong to a gym to do the workouts? No, you don't have to belong to a gym. When you register for the program, you'll be given access to the gym and/or at home workouts. Q: I haven't worked out in almost a year. Will I be able to do the workouts provided? Yes, you can! There are beginner level workout options that are available to you. Q: Can I still drink alcohol? If it fits in your macros/calories for that day, then you absolutely can drink alcohol. Q: How long is the boot camp? The boot camp is a total of 7 weeks, and that includes one full prep week. There is a learning curve when it comes to tracking macros and planning ahead for the nutritional aspect of this program, so the prep week will help you dive full-force into the first official week of boot camp. Q: Do you have to workout every day with this boot camp? No! Of course working out is important, but rest is also very important for your body. I follow the provided workouts 5 days a week, and the remaining 2 days are either both rest days, or one rest day and a low-intensity cardio day (go for a walk, swim, something active). Q: I've tried the Keto diet and was always hungry because of the low amount of carbs I could have. Do you have this problem on your low-carb days or with this program in general? Absolutely not! Let me rewind, and get 100% real with you guys. The very first two days of this program are low-carb days, and I just about BIT Justin's head off....I was super *hangry* by the end of day two. Here comes the big BUT! But, by the third day, it felt like I had so much freedom with my meals that it made up for it. Honestly, the first two days were the hardest. By the time the second week rolled around, I felt totally fine and not hungry at all on low-carb days. In fact, I found (and still find) it difficult to fit in all of my calories on low-carb days! What this program has quickly made me realize is that I was overeating WAY TOO MUCH. I was consuming a ton of unhealthy fats and a ridiculous amount of carbs. I'm definitely more aware of what foods I put in my body, and I've learned so much about food nutrients. Q: Do you get "cheat days"? I don't really have an entire "cheat day," but I will allow myself to have one cheat meal a week. My cheat meal usually falls on Saturday's because that's when our strength training/ leg workout is, and we can consume more calories. With that being said, I'm not going to lie; there have been days when I've craved a Dairy Queen blizzard and I had the calories for it, so you better believe I made it happen. Did it raise my fat percentage? You betcha!! But, you can't win them all, haha. For me, it's basically a fine line between making good food choices and not allowing my cravings to fully take over, but also allowing myself to have a sweet treat now and then so I don't completely go crazy. Q: I'm a breakfast person, so how do you wait until the afternoon for your first meal? It definitely takes some willpower, but it's something you'll get use to! If this program is something you're thinking about, I suggest pushing back your breakfast a little bit at a time over the course of a week. I ate breakfast every single morning, so to help prep me, I pushed eating back from 8:30 to 9:30, then to 10:00, then 11:30, and finally I made it to 12:00! I say the more water you can drink in the morning, the better you'll feel! We can also consume herbal tea and black coffee while fasting as well. *Note: I do have 1 tablespoon of Silk Almond Milk Vanilla creamer in my one cup of coffee every morning. Those are all of the questions I've received over the past few weeks, so hopefully that helped shed some light on what to expect from this boot camp! I'm so excited to be joining a group of ladies for round 2 of T.R.I.M. so I'll continue to share future progress updates, as well as my go-to meals and snacks that I've been loving throughout this program! After completing my second round of T.R.I.M. 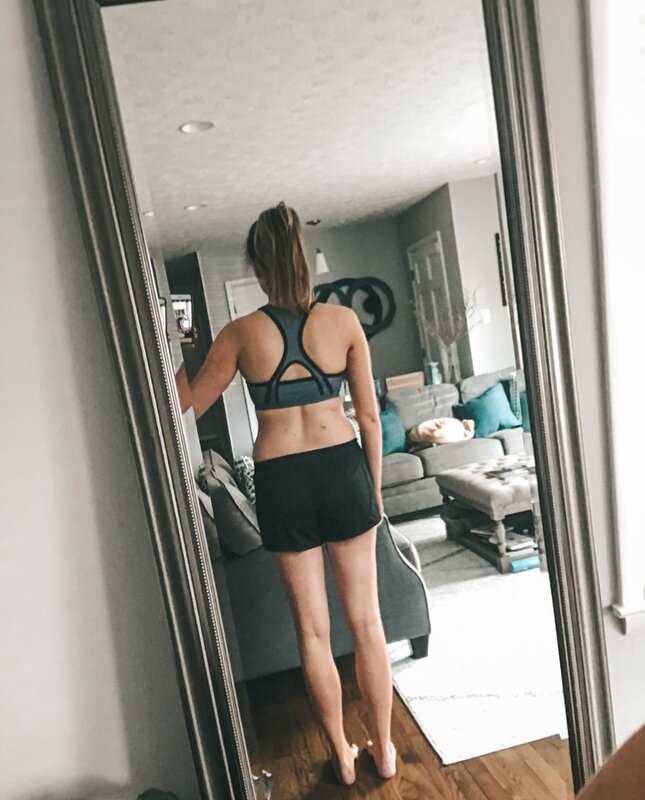 (7 full weeks, which includes the prep week), I lost an additional 5 pounds, 1 inch around my waist, 0.5 inches in my hips, and my arms and legs are even more toned and stronger. So after 2 full rounds I’ve lost a total of 14 pounds, 3 inches in my waist, and over 2 inches around my hips. My skin is the clearest it has been in over 2 years (knock on wood), and I just feel SO. MUCH. BETTER! If you're interested in signing up or reading more information, click the link below!